Early blow drying before work or school call for quick hairstyles that flatter our faces and look great from every angle. Whether your hair is naturally straight or you don those spiral curls, blow drying is a great way to give bounce and body to your locks. As great as this tool is for creating Hollywood-style hair, it is time consuming and can be a hassle to work into our daily routines. Aside from time to invest, a good blowout also requires a lot of heat, which can be damaging to your locks. Here are some tips to lengthen the time between blowouts, without risking oily, stringy looking locks. When putting the finishing touches on your blowout (at home, or at the salon) choose a silk spray rather than an oilier option. Silk sprays offer all of the benefits of a serum without the oily finish that can weigh down hair. It is lighter and comes in a convenient spray, whereas serums tend to come in a pump bottle which produce a heavier product that not only add on to your hair’s natural oil production, but also causes hair to fall flat thanks to its consistency. Check out All-Nutrient Silk+ for a non-grease, light finish! While this hair accessory is a bit dated, it works wonders for keeping blow-dried hair up at night. Unlike regular hair elastics, it will not leave an unsightly crease in awkward areas in your hair. Right before bedtime, pull the hair up into a ballerina bun and secure with a soft scrunchie. This will allow your locks to keep their bounce in the morning, and will prevent them from falling flat or even getting frizzy as you sleep. For extra protection, use a silk pillow case or wrap hair in a silk scarf. No matter how careful we may be in the shower, only the use of a sturdy shower cap can ensure that the hair remains dry and frizz-free. Make sure the elastic on the shower cap is heavy duty; this will prevent it from moving around and exposing your hairline to the water. When washing your face or applying moisturizer and makeup, keep your hair tied back, preferably with a headband or terrycloth band to soak up accidental water drops that can get on your hairline. 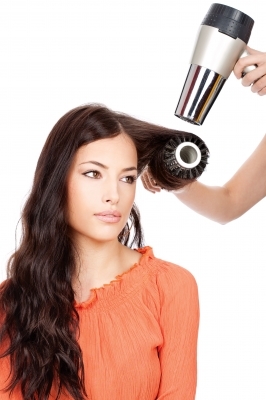 If your scalp begins to feel oily, invest in a good dry shampoo to soak up the oils and refresh your roots. Spray it on your roots to add bounce, then brush through with a natural bristle brush. Be careful not to spray too much, as dry shampoo needs to be brushed through and out correctly to avoid making your hair look dull. In a hurry to get your day started? Dry shampoo is a great way to go a little longer between washes, especially when your day-old blowout is losing its bounce and starts looking a little oily. Try one of our favorite products here! Flat ironing the hair is a great way to achieve a smooth look in little time, however it can also damage the hair by pressing the strands between plates of direct heat. 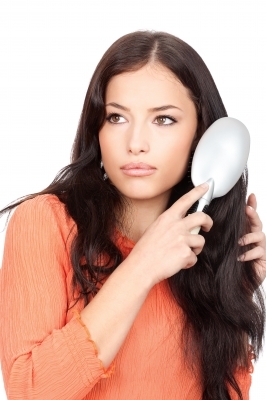 Only use a flat iron to smooth out fly-away strands, or use a small boar bristle brush paired with a bit of silk spray. If your blowout has lasted for three or even four days, and the ends are beginning to look stringy from the oily buildup (or frizzy, for those with dry hair), the urge to use a flat iron to try and revive smooth locks can get high. Instead, use a barrel curling iron to add waves or curls to the ends of hair. Extending the time between blowouts, whether at-home or at a salon, is a great way to save time and money. Using the tips above will keep your locks looking great without the expense of a daily trip to the salon or the time spent with a blow-dryer in hand every morning – all without compromising the fresh look and feel of your hair. How do you refresh your blowout? What tips and tricks do you use to extend the life of your blowout and beat the threat of oily roots? We’d love to hear what you have to say! 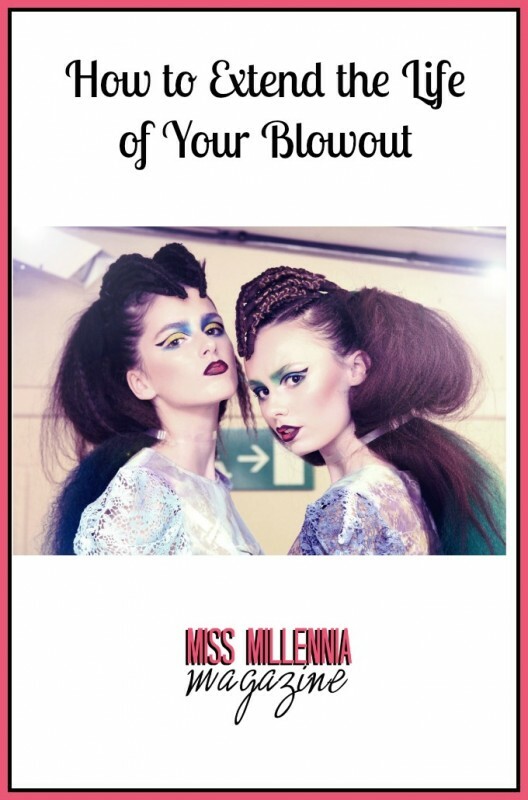 Leave us your comments to start a discussion, or share your tips with us on your blowout routine and how to make it last.